Whether you seek formal or casual, our wrought iron dining table collections are designed to match a wide range of dining room spaces and home decor styles. Elegant handcrafted legs and pedestal bases support a beautiful selection of sturdy table top materials, including wood, copper, and glass, to create an attractive and inviting ambiance. Our iron dining tables are hand forged by master blacksmiths using centuries-old techniques and come in a variety of shapes, sizes and finishes. From small square tables for four to large rectangular designs that will easily accommodate a gathering of eight or more, we offer iron tables to meet your dining room size and shape requirements. Click on any image below to get a larger view and more details about that particular table. Helpful Iron Base Dining Table Information. What iron dining table styles do you offer? What materials can I choose from for my iron dining table? What shapes and sizes will I find within your wrought iron dining table collection? We offer round, oval, square and rectangular dining table designs. 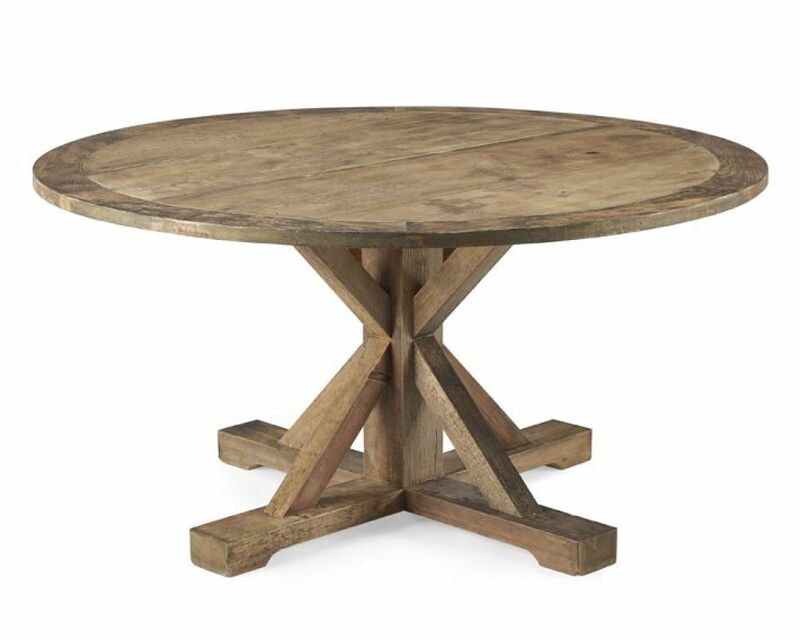 Our round tables range from 36" to 72" in diameter. Ovals are from 42" x 72" to 44" x 72" in size. Square tables are 36" x 36". Rectangular tables go from 42" x 72" to 44" x 84". You'll find other sizes within these ranges. For more technical information and tips, check out our handy Dining Table Guide. You can read online or download it for later reference and printing. Space for place settings - 24 to 30 inches is the ideal width for each guest's space. Height of table in relation to seating - table aprons should not impede comfortable leg space for diners. Chairs or benches should be at a comfortable height for the table you choose. Space behind chairs - optimally, a minimum of 24 inches should be open for traffic flow around the table when guests are seated. For more information like this please refer to our Dining Table Guide which goes into more depth including an info graph that shows you how many people fit per table based on size. Ultimate Guide to Dining Room Tables No matter your dining room style, Better Homes and Gardens' Kristen Schmitt offers lots of valuable information and great ideas for choosing the ideal dining table. From casual cottage to formal traditional, there's something here for every design aesthetic. Square vs. Round Dining Table SF Gate is a great resource for all sorts of Home Guides including this idea-packed one on the pros and cons of round and square dining tables. This guide is meant to help you decide which shape is right for you and your dining room. For more terrific info, ideas and tips about small dining rooms check out our Artisan Iron Furnishings & Decor blog: Dining don't have to be big to be filled with great ideas. See what we mean in "15 Small Dining Room Table Ideas & Tips". "Dining Table Buying Guide: How to Find the Best Table"
Huffington Post's Dickson Wong offers lots of tips for buying the most suitable dining table for your home. From materials to measurements he has you covered. From About.com and furniture expert Abe Abbas comes this helpful guide to buying dining room furniture, including tables and more. You'll even a section on furnishing small dining rooms.